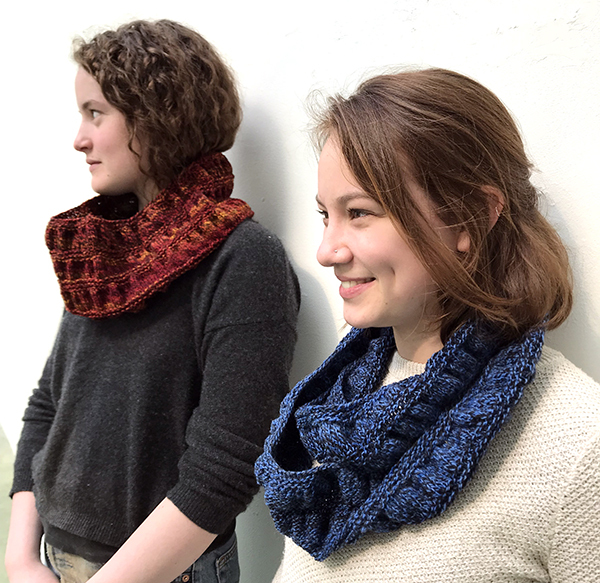 A new cowl pattern and a limited edition kit! We’re pleased to announce the public release of Maureen’s Melody Cowl pattern. This ruched cowl can be knit up at two different circumferences according to your preference.The pattern was created for visitors who participated in last week’s yarn crawl. It features a brand new yarn for the Spinnery that will be officially available for sale this Fall. We provided the I-91 Shop Hop visitors a sneak peek preview of some hand painted skeins of this ragg yarn and it became an instant best seller! Happily, we still have a small quantity of the $25 Melody Cowl kits we created for this event. If you act quickly, you can enjoy one of your own! The project kit includes the project pattern and a single skein of hand painted Ragg-Time. Each hand painted skein is a unique work of art, and each reflects the lush green palette of Vermont in late June. Our Ragg-Time is a 2-ply DK or light worsted yarn that has a very generous 306 yards per skein. Shortly after Labor Day, we’ll have a handful of beautiful colorways for you to choose from, and some more exciting new patterns that feature this yarn. News of those releases will be the focus of September’s newsletter! 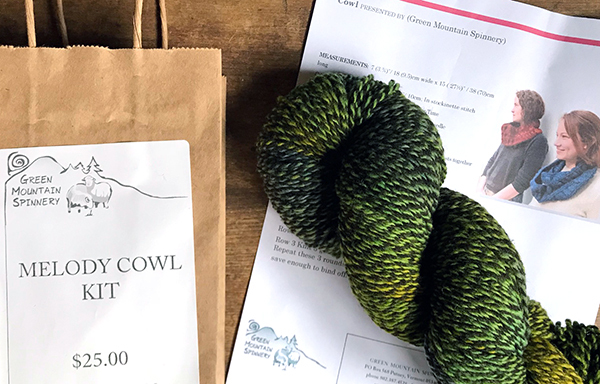 In the meantime, you can craft up a beautiful version of the Melody Cowl pattern using two skeins of any of our DK weight yarns: (Alpaca Elegance, Cotton Comfort, Mewesic New Mexico Organic or Sylvan Spirit. You may find yourself working up more than one! We hope that you have a delightful holiday week and that you find plenty of time for crafting, relaxing and enjoying your time off. Next Next post: Isn’t it always the perfect occasion for bubbles?